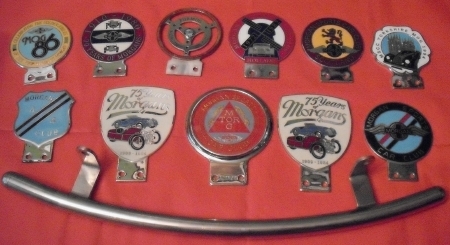 Having been involved with Morgans from 1980 until 1995 with a +8 and 1937 Series 1 my Dad and I collected these Badges. Due to pursuing my car racing, the Morgans unfortunately went but the Badges stayed. I am putting these on the For Sale and they incude an Original 4/4 Club badge by 'Marples Beasley' and also a rare 1 of 3 'FurMog' Badge produced for Cumbria Centre which my Dad was Centre secretary for. I'm not a collector of bages, other than for events I've attended, but I do like that FurMog one. Here is a close up of the 'FurMog' Badge. It was manufactured by hand as were the other 2 and has laminated wood rim with brass rivets on a Stainless Steel centre. Beautiful badge which adorned the front of the +8 for many miles and was admired everywhere it went. Wouldn't mind one of the 75 year badges.